Millionaire Bars offer layer upon layer of decadent goodness with a shortbread layer on the bottom, a caramel layer in the middle and chocolate on top! It tastes almost like a Twix bar and is the perfect cross between a dessert bar and a candy bar! You are going to love these Millionaire bars. If you like Twix bars, you are going to just adore this recipe for Millionaire Bars because they taste just like a Twix bar! 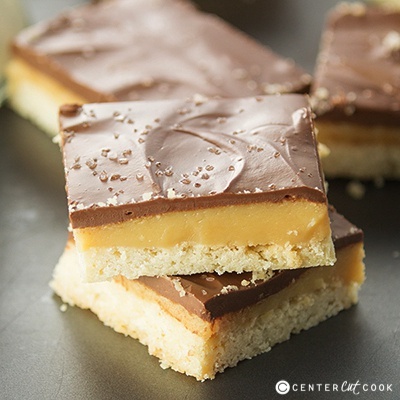 These Millionaire bars start with a layer of shortbread cookie on the bottom, then in the middle is a decadent caramel layer and it’s all topped off with melty chocolatey goodness with a sprinkle of sea salt for good measure. I don’t know how these bars got the name “Millionaire Bars” instead of “Billionaire Bars” because if you ask me, I’d call ‘em Billionaire bars. They are sweet with just a hint of salt, and truth be told, they are kind of addicting. And like I said, if you like Twix bars…. 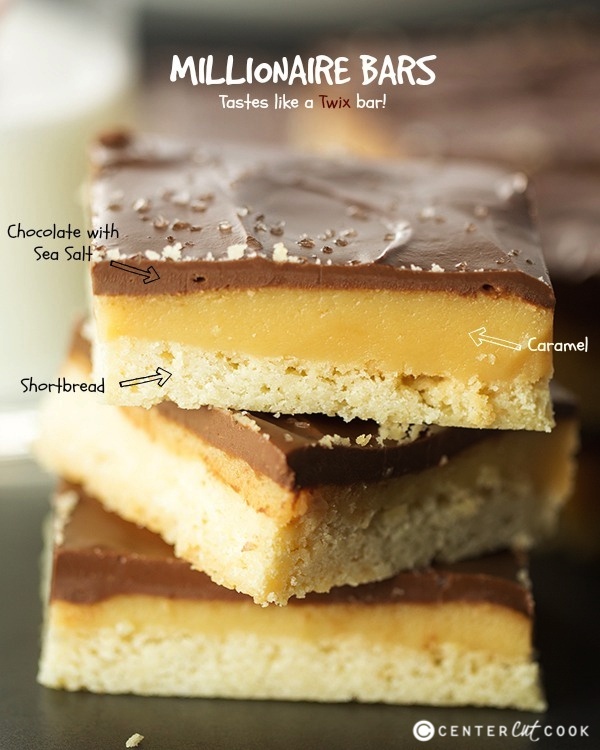 these Millionaire bars are for you! One of the best tricks I have learned along the way is that when I am making any sort of dessert bar, line the pan with foil. You know what I’m talking about right? You place a piece of foil in the pan going one direction, allowing the foil to hang over the edges, then place another piece of foil in the pan going the opposite direction, again, allowing the foil to hang over the edges. This makes it so easy for you to just lift the bars out of the pan to cut them into squares. Each layer comes together pretty quickly, but you will have to allow each layer to set and/or cool before moving on to the next, so it will take a little bit of time to complete these bars. The actual hands-on time required for this recipe is pretty minimal. I think my most favorite part about these Millionaire Bars is the little bit of sea salt that gets sprinkled on top. If you don’t have sea salt on hand, you can just eliminate it, but there’s something about the sweet/salty combo that I just love! Make sure the bars don’t sit in the fridge too long at the very end, otherwise the chocolate will get too hard and it’ll crack when you go to cut the bars into pieces. These Millionaire Bars are a cross between a dessert bar and a candy bar, which makes them the best of both worlds. Enjoy! Pre-heat your oven to 350 degrees. Prepare an 8 x 8 inch pan by lining it with foil, making sure to drape the foil over the edges, then spraying the foil with nonstick cooking spray. The foil will make it easy for you to lift the bars right out of the pan. For the shortbread layer: With your food processor, combine flour, sugar and salt and pulse a few times to combine. Add in small pieces of butter and pulse until you’re left with a crumbly mixture. Press this mixture into your prepare pan and bake for 20-22 minutes, or until the shortbread layer is a light golden color around the edges. Allow the crust to cool completely. For the caramel layer: In a large, deep microwave safe bowl melt 8 tablespoons butter. This should take about 1 minute and 30 seconds. When the butter is melted, add the sweetened condensed milk and corn syrup. Whisk well until the butter is incorporated into the mixture. Microwave for about 6-8 minutes, making sure to stir the mixture every 30 seconds. At first it’s going to seem like something went wrong. Eventually the mixture starts to thicken and will change color to a light golden brown, that’s when you know it’s done. 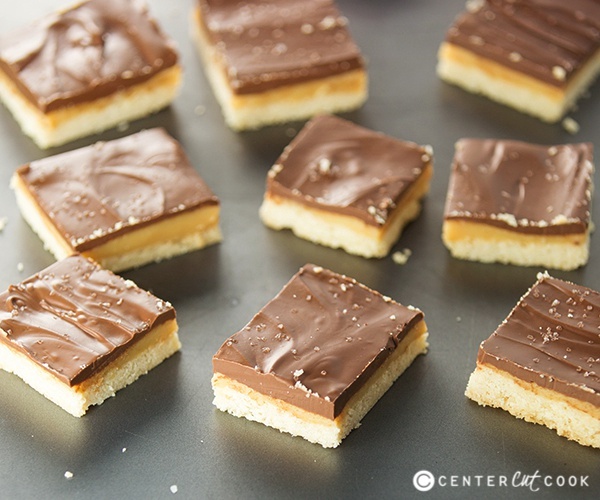 Pour the caramel layer over the shortbread layer and allow to to set and cool to room temperature. You can speed the process along by placing it in the fridge for about an hour. In a large microwave safe bowl, add in 12 ounces milk chocolate and 1 tablespoon butter. Microwave at 50% power for 1 minute, then stir, then continue microwaving in 20 second increments, stirring between each, until the chocolate is melted and smooth. Pour the chocolate over the cooled caramel layer, then sprinkle with sea salt and allow it to set for about 10 minutes, then place the barsi n the refrigerate to cool completely for about 30 minutes. Use the foil handles to lift the bars out of the pan. Cut into pieces and serve.